The development and deployment of radar equipped night fighters during World War II occurred quickly in the European theatre. This was due to the urgent necessity for both Germany and the Allies to defend against night bombing campaigns. The US Navy and Air Force did not have the same motivation to develop and deploy night fighters in the Pacific. Carrier based aircraft were less suited to night operations, or more specifically night deck landings. Japanese bombing -- operations were generally short range tactical based, and conducted during daylight hours. The Japanese only conducted some nighttime nuisance bombing of the Pacific Islands using floatplanes and obsolete aircraft. Even when the American night bombing campaign commenced over Japan, the Japanese military psyche shunned away from defence strategies. Night interception strategies were therefore slow in coming. When the US Navy and Marines eventually formed night fighter squadrons, it is therefore no surprise that these units were limited in numbers and operations. The prototype F4U2 was converted from the first production F4U1 during 1942. The first F4U2 flew on 8 January, 1943. The XF4U2 differed from the standard day fighter by the inclusion of a microwave-pulse based, airborne interception XAIA radar unit mounted in a bulbous fairing on the front edge of the starboard wing, and the deletion of the outboard .50 cal. machine gun. The latter modification was made to compensate for the extra weight of the airborne radar. This weight reduction meant that the top speeed was reduced by less than kph when compared to the F4U1. A rudimentary 3-inch radar scope was also added to the centre of the main instrument panel. The production model AIA radar unit was intended to have a useful search range of 3.2 kilometres at an altitude of 600 metres or higher (Veronico and Campbell, p.48). The antenna mounted in a streamlined dome did not adversely affect the superb flying dynamics of the Corsair. The first Corsair night fighter squadron VF(N)-75, was formed in January 1943. However, the first night fighter squadron was not deployed in the Pacific until October, 1943. By early 1944 all three US night fighter squadrons had been deployed - VF(N)-75 was a land based Naval squadron (something of a peculiarity): VF(N)-101 another Naval squadron but based on the USS Enterprise; and VMF(N)-532, a Marines squadron based in Tarawa. 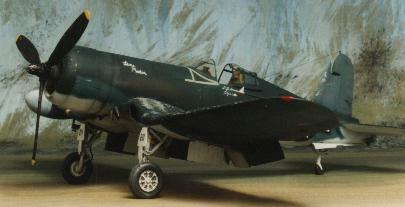 Despite the technical success of the AIA radar, kills in the night Corsair were relatively rare. VF(N)-101 scored a total of 5 confirmed, 4 damaged and 1 probable between January 1944 and their disbandment in July of the same year (Veronico and Campbell, p.48). VMF(N) - 532 also scored at least three victories. The F4U2 was also quite successful in the role of nighttime and dawn harassment bombing and strafing. This success was despite the reservations held by some senior Marine flyers who believed that this type of operation was not appropriate for the highly specialised night-fighter pilots. The F4U2 and its pilots were nevertheless successful as pioneers of night-flying tactics in the Pacific theatre. As far as my research indicates, no F4U2s were used operationally by any foreign Air Forces, although the Royal Navy may have evaluated one. Despite the relatively brief service history of the F4U2 Corsair, it was significant because it spawned a new generation of US Naval night fighters. The night fighter versions of both the Wildcat and Tigercat owed their existence to the pioneering of the F4U2. In addition, its direct descendant, the F4U5N was widely used with great effect in Korea. The Great Book of WWII Airplanes (Corsair Section); Frederick Johnsen; Wing and Anchor Press; New York; 1984. Scale Aircraft Modelling - Various Issues. And special thanks to Steve McKenzie for access to his collection of books and photographs.